From left are winners, Trevor Villet – Williams Hunt Port Elizabeth; Kenneth Cupido – CP Nel Motors; Ian Nicholls, President and Managing Director, General Motors Sub-Saharan Africa, Glynn Crookes – Key Durban; Mark Wilson – Jacksons, Pieter Kruger – Sydfred Motors. 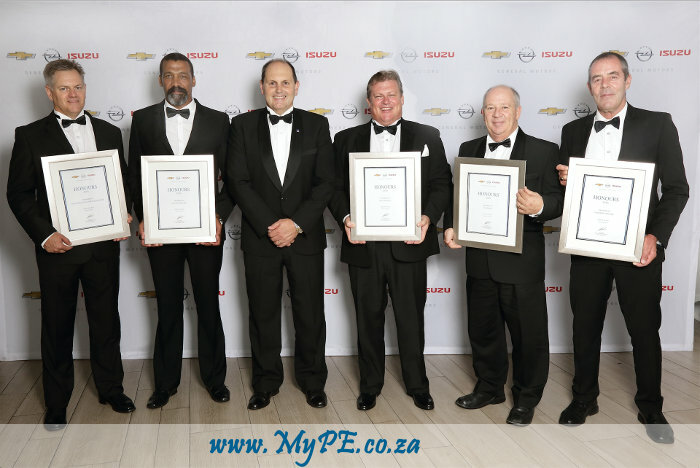 The top performing dealerships in the General Motors South Africa (GMSA) network have been honoured for the exceptional service they provided to Chevrolet, Opel and Isuzu customers in 2016. The prestigious GMSA Dealer Honours awards ceremony was held recently to recognise dealers who excelled in sales and customer service. Ian Nicholls, president and managing director of GM sub-Saharan Africa, said the awards importantly afforded the opportunity to applaud dealers “who go the extra mile to ensure customers are well cared for and remain loyal to our brands”. “GMSA puts the customer at the centre of everything we do,” said Nicholls. “In 2015 we rolled out the Complete Care programme, demonstrating our commitment to this core value and ensuring our customers peace of mind in their ownership experience. “We further extended this commitment by ensuring our dealer staff and technicians are attuned to the customer, keeping the customer in mind in everything we do. Technicians receive regular training to keep up to date with the ever-evolving technologies – we invest in 60 000 hours of dealer development and training per year. All GMSA service centres are equipped with a complete range of tools and analytical systems to carry out maintenance and repairs,” Nicholls said.